Yearly landmark as the last "event" requiring any organisation before the summer vacation really starts: Mum's birthday. This year celebrated with friends at Hamar, with due amounts of cakes, fruit salad by me (above), children present presenting presents and other ingredients of family birthdays. 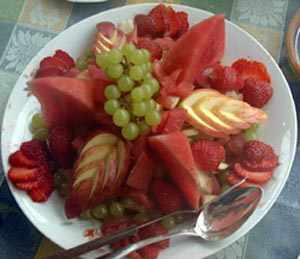 If you wonder how I made the fruit salad, the recipe is on the net.